I stopped in my tracks at Baughman’s Salvage Yard as I wandered around taking photos of vehicles in various states of decay. There was a beautiful, (eye of the beholder) vintage ambulance or emergency vehicle among the lines of rusted vehicles, with York, PA, barely visible. Imagine the stories that came with a ride in this ambulance. The last date of inspection was 1999. Thanks for visiting my blog! Click like and share with others. 🙂 ~P. Click on the first thumbnail to open! Enjoy! Back in it’s hay day. The following information is from a comment below by Jim, who also email the photo above, to me. Thanks Jim! ~P. I believe it was a 1956 Chevy but I could be wrong on that. I had to buy parts for it back in the sixties and that year sticks in my mind. Before it was RED, it was white and some referred to it as the “Ice Cream” truck. It responded to all major fires and served hot coffee, soup and donuts to the FFs and those displaced from their houses. It was a “haven of heat” for those that fought fires that occurred in the winter. These were the days when ambulances did not respond routinely to calls and it also served as a medical/first aid/rehab unit. Its responses were not limited to York City, it also was requested by many county FDs for major fires. It was one of the few (if not the only) city apparatus to have a “County” low band VHF radio installed. As stated before, It was owned and operated by the Lincoln Fire Company. Two of its busiest years were 1968 and 1969 and anyone older than 10 at that time should remember what was happening in York. It also stood by at the Kiwanis Lake Labor day celebration each year and provided first aid services to the crowds. These were the days before “EMTs” and a certified Red Cross person with Standard and Advanced first aid was the highest level of training available. Mouth to Mouth resuscitation was becoming popular as well as that ” new thing” called CPR. Its death was due to several issues: Lack of Volunteers (the volunteers that joined the station wanted to fight fires, not serve coffee), county FDs establishing their own Canteen trucks with a much faster response time, expense of operation, the age of the vehicle, and IMHO-better fire suppression, better trained personnel, and better fire prevention in York City led to a reduction in the number of major fires, in which its services were needed. It took a while to make coffee, buy donuts and respond. Towards the end, it would be responding and the event would be over. 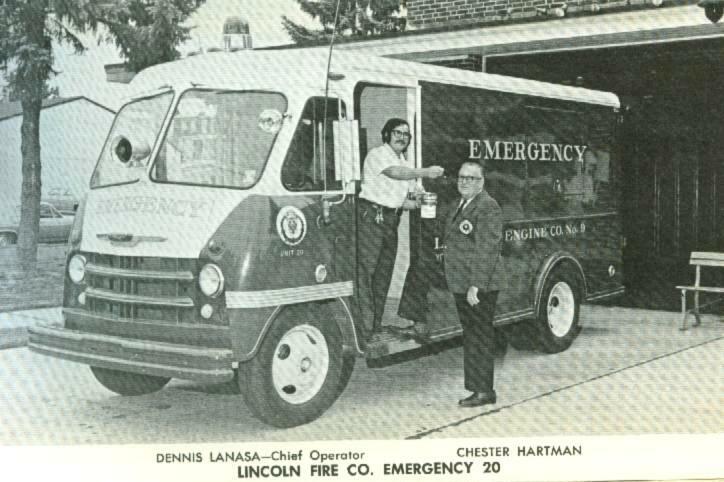 This would have been the Lincoln Fire Company’s canteen truck. It started as a Civil Defense / Red Cross type unit, and evolved into a canteen truck. It was used to provide food and drink to firefighters at large fires. The rig didn’t run many calls, and the fire company eventually sold it. The last I had heard, it was being used by a mobile food vendor. Thank you for the inside information! I searched online for info, but found nothing. I greatly appreciate your comment! ~P. Correct. The unit was sold by the Lincoln Fire Company. It was eventually procured by Earl and Delores Blouse who operated it for many years as their mobile food service truck. It was sold when they sold their business. I have a few pictures of it that I can upload to you if you let me know where you want them sent. I do not do social media. Thanks for the pics. Thank you for all the wonderful information! Yes, I would love to have some pictures of Unit #20 from back in the day. Please email them to Girlboxer1970@yahoo.com. Put Unit #20 as the subject so it catches my eye, Again, thank you! ~P.